Ever see a sheep get a haircut? Join us on the farm for one of our signature events! 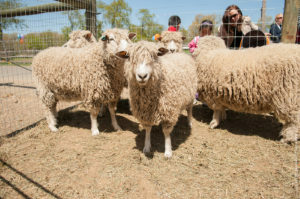 There will be shearing and wool spinning demos throughout the afternoon. Enjoy in-depth tours with our farmers, find out how easy recycling can be at the Con Edison Ecology booth and learn about our Community Compost Program. Pick up flower and vegetable seedlings for your garden. Enjoy live music, kids crafts, hayrides and tasty local food on the farm all day.